Strapless Tiffany Exclusive dress 46175 is sure to steal the spotlight at your upcoming special event. 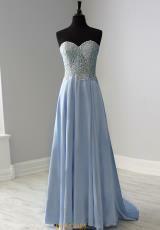 The beaded bodice has a strapless sweetheart neckline and a zipper closure in back. Shimmering stones cascade down the dress until the flowing satin skirt. This A-line skirt has a thigh high slit, perfect for showing off your favorite pair of heels.